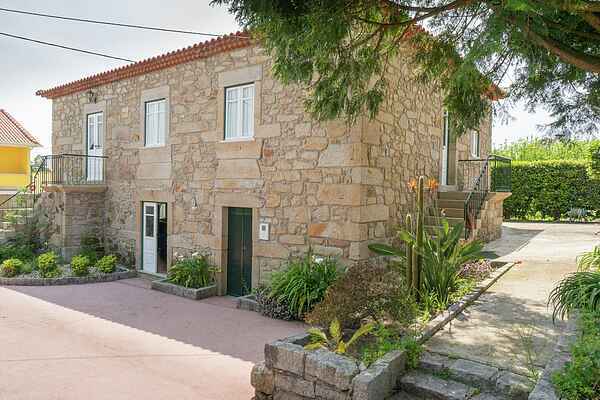 This detached holiday home with private pool near Ponte de Lima in Northern Portugal, was the country house of a vineyard in the past and has now been transformed into a cosily restored holiday home. The holiday home is homely but comfortable and is located on a 1 ha estate. You will find the living/dining room on the ground floor, which can also be used as a recreation room with its billiard table. You have great views on the pool and the garden from the roofed terrace. You can dine outdoors at the pool house in the summer months or make delicious meals on the barbecue or in the kitchenette. The holiday home offers fun for young and old. You can play table tennis or games together and then cool off in the pool. You will find various restaurants, bars and small supermarkets at only 100 m distance from the holiday home. The typical centre of Ponte de Lima is only 1.5 km away. Ponte de Lima is a picturesque town of 1125, and is often called the oldest town in Portugal. The Portuguese city of Porto, famous for its port wine, is some 80 km away and is also worth a visit. Sun worshippers will also find this is a good base. The nearest beach is in Viana do Castelo at approx. 22 km. Nature lovers can visit the nature reserve Serra do Gerez at approx. 35km distance. You can walk here while enjoying the natural beauty and panoramas. In short, the apartment has a good location to explore Northern Portugal.